Have you ever dreamed to hold the center stage of any party? Have you ever dreamed to become the soul of any company? If you have answered «Yes» to these questions — this kind of pastime is just for you! A German philosopher Friedrich Nietzsche said, “Without music, life would be a mistake.” It is undeniable that music has an important place in our lives. The guitar is one of the most popular musical instruments and playing guitar has many benefits. Let us start by considering the facts. The medics discovered the beneficial effects of good music on the human body a long time ago. In the process of learning to play the guitar, you develop your ear for music, as well as your voice. 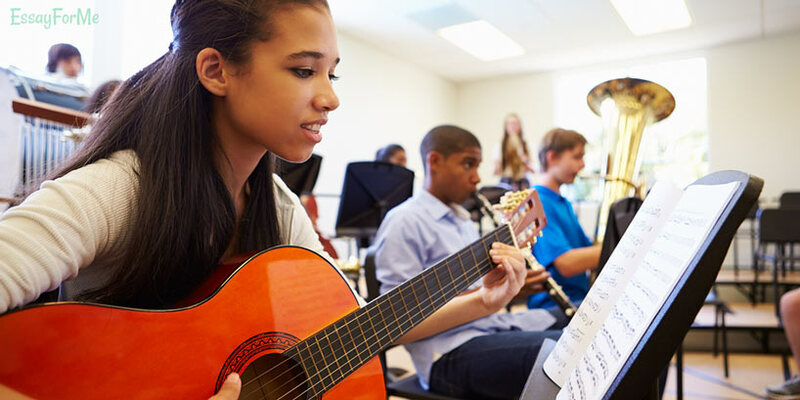 The music lessons develop the left part of your brain. Moreover, among people who play music, there is a higher percentage of ambidextrous — people, who can use both the left and the right hand at the same time (in contrast to right-handers and left-handers). The left hemisphere is responsible for creativity, sense organs, imagination, and ability to think extra-ordinary. Also, the left hemisphere is similarly responsible for the feeling of rhythm, while the right one hears the voices and distinguishes the melody. This means that the development of both hemispheres of the brain is balanced. Furthermore, one should not forget that the ability to do what others cannot automatically add to your popularity, social importance, and admiration. No doubts that, you will always be in the spotlight. What is more, you increase your positive feelings; improve confidence in your abilities and capacities. This kind of musical instrument demands a lot of hard work. It builds the character and the will of the guitarist, it makes their spirit stronger. In addition, Dale Carnegie argued that occupational therapy is the best cure for all psychological and physical ailments. Victor Hugo pointed out that music can help you to express that what you can’t say and what you can’t keep silence. Thus, playing guitar can save you from depression and low spirits. According to some experts, it develops oratorical talent, improves your written and oral speech and increases your vocabulary. Music also takes part in the upbringing of the individual tastes and style. From these facts, one may conclude that playing the guitar is not only a fascinating pastime but also on the acquirement of the basic characteristics of the holistic harmonic personality. Rated 4.4 | 297 votes.